A 26 –year old Chinese man was very frustrated to find his breasts getting bigger and bigger and went to see doctors for treatment. Mr. Li, a college graduate, loves to eat fried chicken wings and drumsticks. Doctors later told him the hormones in the chicken were the reason behind his growing breasts and advised him to eat more vegetables and fruits. The CCTV report, which it said was based on a year of undercover reporting, found that chicken farms had lights turned on around the clock to make the birds eat non-stop and grow faster, with a chicken growing from 30 grams to 3.5kg in just 40 days. 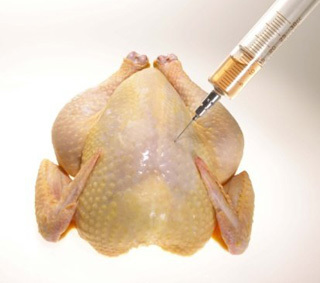 Farmers had given at least 18 kinds of antibiotics to chickens so that they would not become ill.